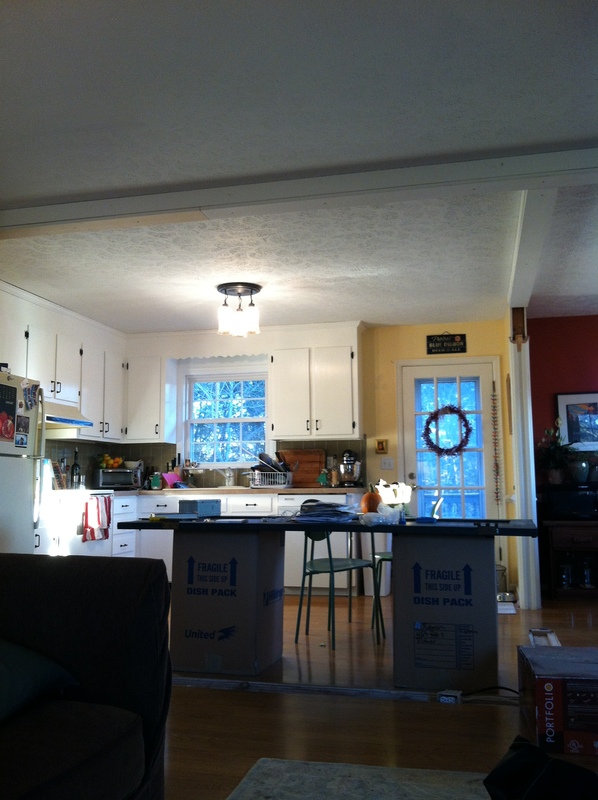 Kitchen Redo: Lighting | Small, but valuable. It was shiney and gold and bright. Bright was the winning point. I assumed we would get rid of it someday, and Scott assumed that its working condition meant it was a keeper. Until it became broken. I’m happy to report that I wasn’t the fan breaker, and it was a complete accident. Everyone wins! Scott didn’t have to replace a working fan, and I did indeed get to replace it. 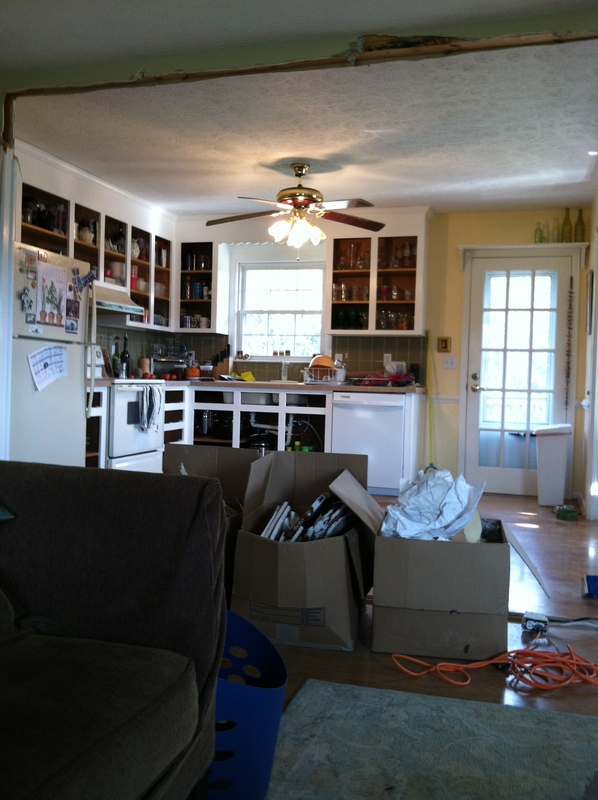 Our kitchen is in better shape than that these days, I just didn’t take a ton of “before” pictures of the fan. I mostly tried to ignore it. It doesn’t look so bad there, actually, but do you know what’s better? It might look like a bright blob of light in this picture, but I love that bright blob. I’m not a lighting expert, that’s for sure. I do know a few things though. The ceiling looks taller with a light closer to the ceiling. That fan took up a chunk of visual space. And I personally think that the mercury glass adds a nice touch of authentic flair to the colonial-style house. Woohoo! P.S. Like our moving box island? It’s growing on me. P.P.S. 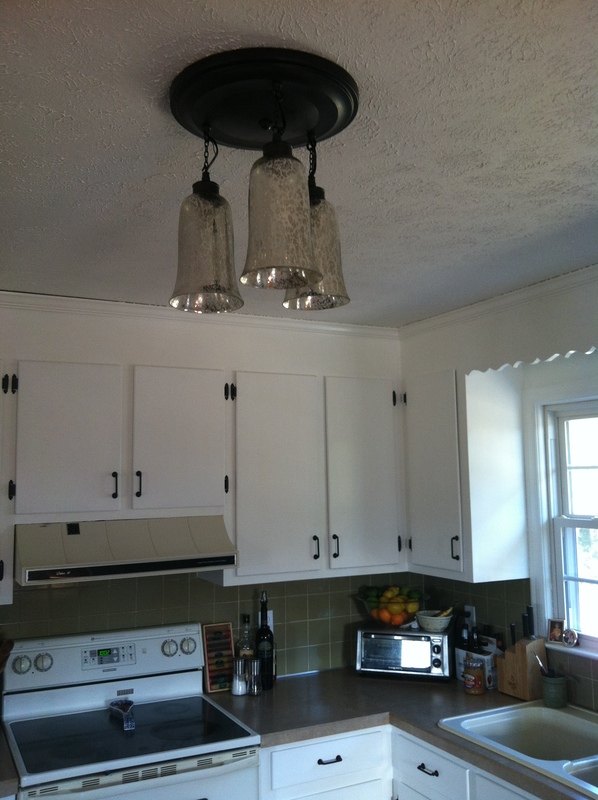 Want a mercury glass light fixture for your house? Well, it did cost the same as painting our cabinets and new hardware for the cabinets combined ($250, Pottery Barn Brantley Antique Mercury Glass Semi-flushmount). Thanks to a generous Christmas gift card that I hoarded for two years and a gift from my parents, it was free to us. I tried shopping around for a better deal, and I kept coming back to this light. Thanks, gifters!